She looked up at its oddly-shaped head, which despite its larger figure was similar to that of a large man's in size. It appeared to be made of brass, but with circular glass protrusions held in place by an x-shape of brass struts that reminded her of a drawing of a diving helmet from one of her father's books. The rest of the apparent face was smooth and implacable. Within the creature, she could hear the echoing of many ticks, the noises of gears and cogs in motion that she had heard from outside. The Clockwork Cowboy is my newest short story in print - and it's a delight to be included in the latest anthology from Writerpunk Press. Regular readers of the blog will have heard of Writerpunk Press before - they published the fantastic Edgar Allan Poe goes punk collection of short stories that I gave five stars to and rated as one of my books of the year, so it's a real honour to feature in one of their publications. This collection sees classic horror stories given the punk treatment - there are takes on stories by HP Lovecraft and Sheridan Le Fanu, of Oscar Wilde and Franz Kafka, of Bram Stoker and... well, then there's Frankenstein, which inspired my story. I love Shelley's tale, and the thought of reimagining this manufactured man was irresistible. So in I plunge to a Wild West world with Tesla tech and whirring cogs. The rest? Well, you'll have to see. There's more to come from this world from me too - look for further stories in this same setting, starting here on this blog soon. 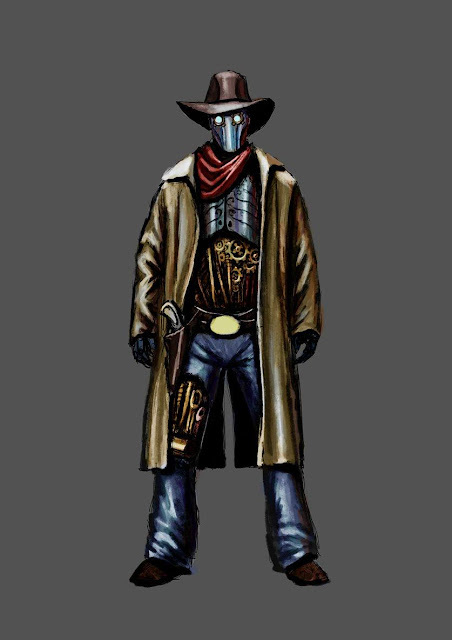 A special word of praise for artist and author Enesha Bennett, who created this image of the Clockwork Cowboy himself. Many thanks for creating a vision of the character, helping to bring him lurching to life! You can find out more about her work on her website, here, or follow her on Twitter, @ejbennett123. 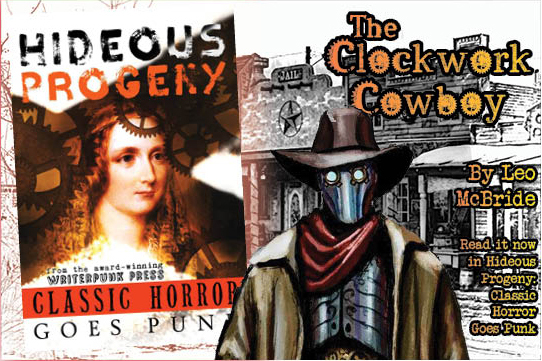 I hope you'll join me and the Clockwork Cowboy in our world - and the other writers in the anthology. Funds raised from the sale of the anthology are to be donated to PAWS Lynwood, an animal shelter and wildlife rescue facility located in the Pacific Northwest. Here's a preview trailer - and at the bottom is a link to buy the book. Happy reading! Link below not working? Click here instead. And looking for some music to get in the mood? Check out the Clockwork Cowboy playlist on Spotify.